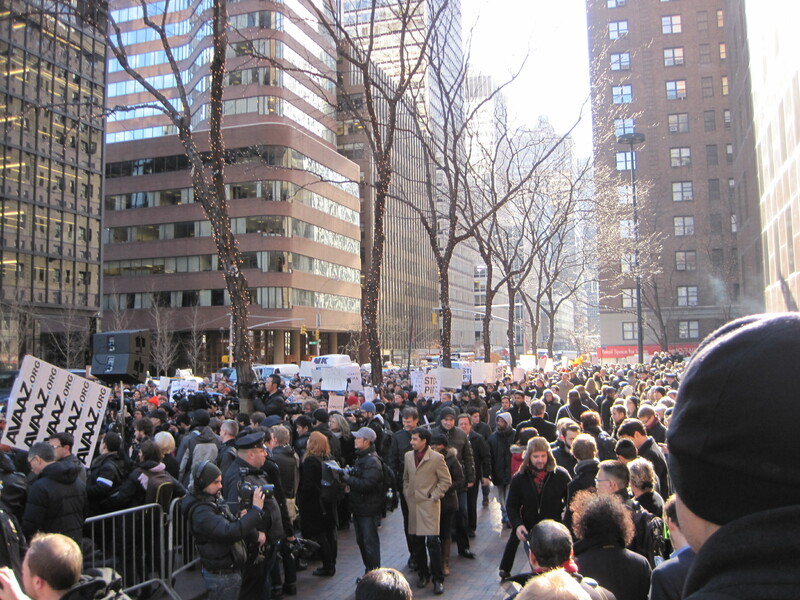 Members of New York’s tech community, a couple thousand strong, braved the winter chill outside the offices of New York senators Charles Schumer and Kirsten Gillibrand to protest the PIPA and SOPA legislation Wednesday. The assembly, organized by New York Tech Meetup, highlighted the rising importance of New York’s tech community, which has grown in recent years and often deals with the kind of user-generated content that could be targeted by the PIPA and SOPA bills. 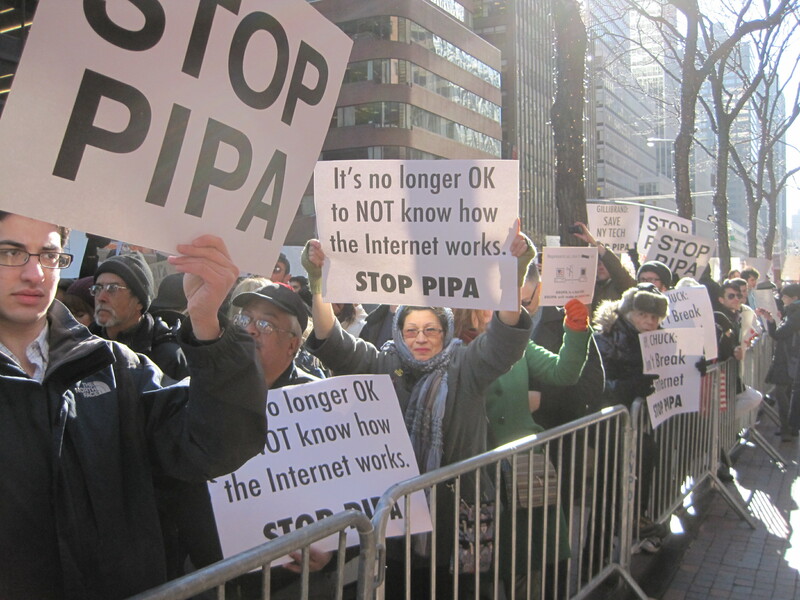 Schumer and Gillibrand are both co-sponsors of PIPA, also known as the Protect IP Act, the senate version of the SOPA or Stop Online Piracy Act. Speakers lashed out against the legislation, calling it an overreaching tool to stop piracy brought by old media industries that are trying to buy laws through lobbying, rather than innovate. They said the danger of the bills could be crippling for New York’s tech community and for the city at large, which increasingly looks to the tech sector as an engine for growth. Joel Spolsky, founder of Stack Exchange and Stack Overflow said the proposed legislation won’t achieve its goals of stopping piracy and stimulating jobs. But it could have dire effects on the Internet if enforced. 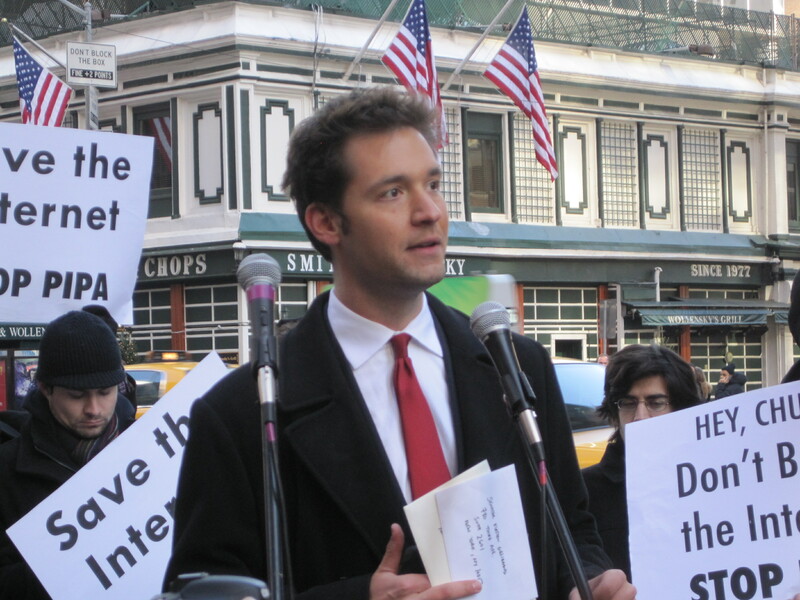 Brad Burnham, a partner at Union Square Ventures, said the vagueness of the bill could hurt investments in start-ups, who may get caught up in the enforcement of piracy. Clay Shirky, an NYU professor and technology author, said SOPA should be labeled the “First Amendment Sunset Act,” because of the way it affects Internet user’s ability to speak freely. He said the old media industry is trying to create a chilling effect that ultimately discourages free speech and debate. “What they’re (senators Schumer and Gillibrand) saying to us is this: everyone’s got a choice, the Internet, the First Amendment, corporate control of public speech. Pick two,” he said. Senators are listening, many of them have dropped support of these bills because of people like us voicing our complaints. So either let a few questionable piracy hypotheticals stay as they are or shut down some of the biggest industries causing the loss of jobs, years of hard work, open doors for businesses, and outrage across the country? The internet affects everyone more then they know. Even the person who set up these acts probably sits in front of a Laptop all day, clicking away at Google. A lot of actions and dreams and possibilities have been built from the internet and its expansion is helping creating more jobs than ever. If you just take a huge chunk of that away, you’re going to shake a world who’s come to depend on such a network as foundations of living. Its going to ruin everything!